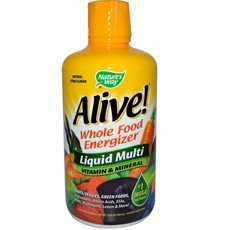 Enjoy Natures Way Alive! Liquid Multi-Vitamin Citrus Flavor. Alive! Liquid Is The Ultimate Nutritional Energy Source?With The Greatest Diversity Of Daily Essentials, Whole Food Concentrates, Phytonutrients And Antioxidants To Nourish, Protect And Invigorate Your Body. Each Serving Delivers Exhilarating Natural Energy From:25 Vitamins & Minerals, 24 Fruits & Vegetables, 18 Amino Acids, 13 Green Foods, 12 Organic Mushrooms, Plus Bioflavonoids, Efas, Herbs, And Nucleic Acids. (Note: Description is informational only. Please refer to ingredients label on product prior to use and address any health questions to your Health Professional prior to use.